The International Biology Olympiad 2018 took place at the Shahid Beheshti University, Tehran, Iran during July 15-22, 2018. The Ministry of Education, I. R. Iran hosted IBO2018 where 70 IBO member countries participated. After participating as an observer country in IBO2015, and competing as a team in IBO2016 and IBO2017 Bangladesh has competed in this mega event for the third time in 2018. The students were selected through a nationwide multistep talent hunt. Bangladesh won a medal at IBO for the first time this year. Auddithio Nag secured a Bronze Medal. That is probably the fastest acquisition of medal at any International Olympiad, at least for Bangladesh. 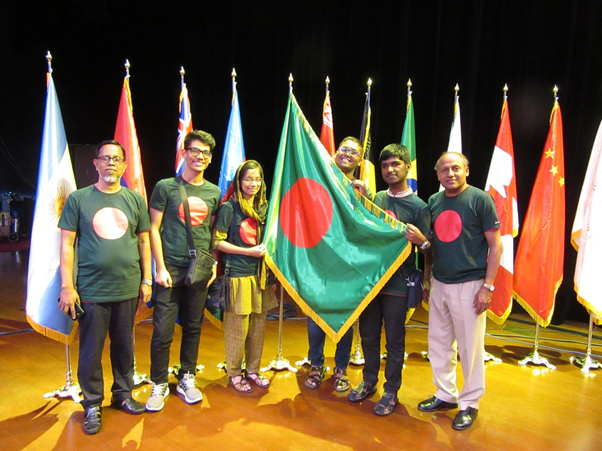 IBO 2018 Team Bangladesh; (left to right) Deputy Leader Gazi Mohammad Zakir Hossain, Students [Auddithio Nag, Prokriti Projukti, Md Bayezid Mia, Md Tamzid Hossain Tanim] and Leader Rakha Hari Sarker.